OWoN: It's a sad world where arms prices are cut to get mass sales and mass killings for money. Whatever it takes to keep economic growth moving. At the Africa Aerospace and Defence Expo earlier this month, weapons buyers from across the continent descended on Air Force Base Waterkloof in the South African capital Pretoria for a bit of shopping. There, they were wooed by Chinese defense gear giant Norinco, which has honed its pitch to an art. Namibia Deputy Defense Minister Petrus Iilonga, wearing Prada SpA sunglasses and a Lenin pin, studied models of battle tanks before representatives from Norinco, also known as China North Industries Group Corp., ushered him into a room marked VIP for some personal salesmanship. Nearby, the Tanzanian military chief, General Davis Mwamunyange, furrowed his brow while a company official in a charcoal suit and an orange tie discussed a truck with a radar device mounted on the back. A live test was conducted on the system about a month ago, the official, who declined to give his name and had his ID badge turned backward, told his visitors. More than three decades since Deng Xiaoping and the Communist Party founded Norinco in the wake of a humiliating border war with Vietnam that ended in stalemate, the Beijing-based company sits atop a military-industrial complex that increasingly rivals the U.S. war machine in firepower and influence. 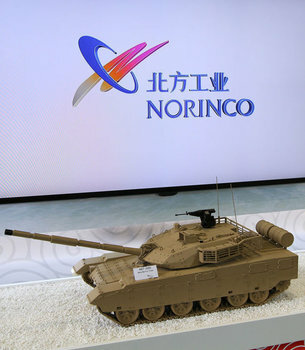 Norinco’s sales have expanded faster than any other major defense company over the past five years, surpassing Lockheed Martin Corp. (LMT), maker of the F-35 fighter, and General Dynamics Corp. (GD), which produces Abrams tanks. The company’s $62 billion in revenue and 275,000 employees embody the clout of China’s defense industry as the party pours hundreds of billions of dollars into the People’s Liberation Army and molds Mao-era weapons makers into growth-driven conglomerates. Non-defense units of sprawling Norinco often benefit as it courts buyers of bargain-priced weaponry, gaining an entry point to sell their products to the same customers. With foreign sales of $7.4 billion over the past five years, China overtook France in 2013 to become the world’s fourth-largest arms exporter, according to Stockholm International Peace Research Institute. Besides Norinco, the country’s arms makers include Aviation Industry Corporation of China, Poly Technologies Inc. and China South Industries Group Corp. Norinco is the biggest of the bunch. The company’s rise parallels those of network-equipment maker Huawei Technologies Co. (002502) and mobile-phone producer Xiaomi Corp., Chinese companies that have used aggressive pricing and solid technology to compete globally. Norinco’s MBT-3000 tank boasts similar firepower and speed as the Abrams and costs about $4 million, compared with $6.9 million for the American model. Still, the creation of this powerhouse has broader implications: Armaments aren’t smartphones. Greater military strength has allowed President Xi Jinping to pursue China’s territorial claims with a new vigor. He has sent fighter jets to patrol a new aircraft identification zone over East China Sea islands claimed by Japan and dispatched ships to chase Vietnamese vessels away from an oil-exploration rig in the disputed South China Sea. Norinco’s products give it a supporting role in such disputes. It supplies laser-guided missiles to China’s air force, deck-mounted guns to its navy and missiles able to reach Taiwan, the self-ruling island China regards as a province, according to U.S. Defense Department reports and Norinco literature. Norinco declined to comment on the company’s business strategy or make executives available for comment after five e-mails and several phone calls to the company’s public relations representatives. The Norinco sales staff at the defense expo in Pretoria Sept. 18 declined to comment. Norinco’s sales grew an average of more than 20 percent annually over the past five years, faster than any publicly traded defense company with revenue of at least $5 billion, according to data compiled by Bloomberg and IHS Jane’s. In March, China said it would increase the PLA’s funding by 12.2 percent to 808 billion yuan ($132 billion), a sum exceeded only by the U.S.’s $572 billion defense budget. Chinese-made weapons are also piling up in the arsenals of small or developing nations seeking to upgrade equipment without the diplomatic strings usually attached to deals with American and European manufacturers. China signed about $10 billion in agreements to sell conventional weapons worldwide between 2008 and 2012, with many going to Sub-Saharan Africa and Latin America, the U.S. Defense Department said in June its annual report to Congress. In the weapons business, market share usually brings diplomatic clout. That goes for China, as well as dealers like Norinco, which must provide parts and supplies. The country’s share of international arms exports tripled last year to 6 percent from 2 percent in 2009, according SIPRI. Pakistan was its biggest market, accounting for almost half of Chinese weapons exports. One prominent customer has been South Sudan, a Chinese source of oil, where clashes between the government and members of the Nuer ethnic minority have since December caused widespread famine and forced more than 1.8 million people from their homes, according to a Sept. 4 UN report. The Chinese Ministry of Foreign Affairs described South Sudan as a friend and said it was working hard to bring both sides to a peaceful solution. China is expected to send 700 troops to protect civilians working at South Sudanese oil facilities later this year. The fighting shut down about a third of the country’s oil production, which is pumped by China National Petroleum Corp., Malaysia’s Petroliam Nasional Bhd. and India’s Oil & Natural Gas Corp. The companies evacuated some staff from the country because of the violence. Gear produced by Norinco and other big Chinese weapon makers holds particular appeal to developing nations. “In terms of actual capability, they’re comparable to what makes up the bulk of the U.S. forces today,” Roger Cliff, a senior fellow at the Washington-based Atlantic Council, said of China’s arms industry. 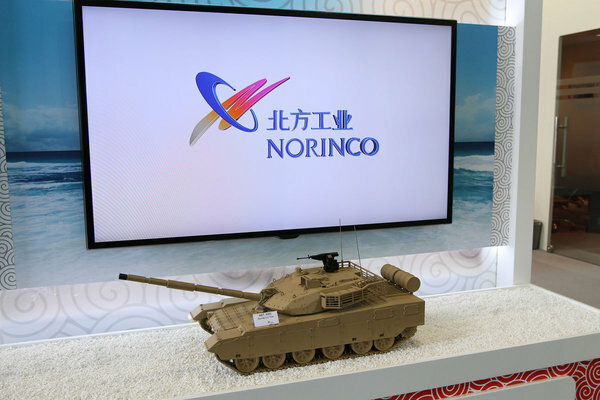 In August, Norinco treated diplomats, military officials and defense contractors from 44 countries to a demonstration of its latest tank designed for export, state media reported. A promotional video shows the MBT-3000 at an event in Inner Mongolia, barreling over obstacles to a guitar-rock soundtrack. The vehicle not only costs almost $3 million less than its American rival, an automatic loader for the main gun allows it operate with three crew members instead of four. At the defense show in Pretoria Sept. 18, Iilonga, Namibia’s deputy defense minister, declined to comment about his interest in Norinco products after a 15-minute session in the VIP room with company representatives. “The fair is going well. There’s lots to see here,” he said. Norinco’s growing profile on the world stage was aided in 2006, when it worked with experts from the University of Georgia to establish an internal unit to help make sure its activities comply with international law. The led to the Bush administration’s 2007 decision to lift sanctions it leveled against the company accusing it of transferring missile technology to Iran. Today, Tai Ming Cheung, director of the Institute on Global Conflict and Cooperation at the University of California, San Diego, estimates that weapons account for no more than a third of Norinco’s sales. Among its 56 major subsidiaries, including a dozen publicly listed units, are hotel companies, truck makers and oil service outfits. It provides auto parts for Volvo AG and is in talks to build railcars at a former U.S. Air Force base in Maine, part of a long trend toward diversification among Chinese military conglomerates. The Communist Party has encouraged defense firms to partner with private companies and exchange ideas, helping them better adapt to the technological revolution in warfare. Norinco and Alibaba Group Holding Ltd. (BABA), for example, have agreed to invest 1 billion yuan in a venture that provides services based on China’s BeiDou Navigation Satellite System, a competitor to the U.S. Global Positioning System, according to a July report in the state-run financial publication, Great Wisdom. Norinco and Alibaba both declined to comment. 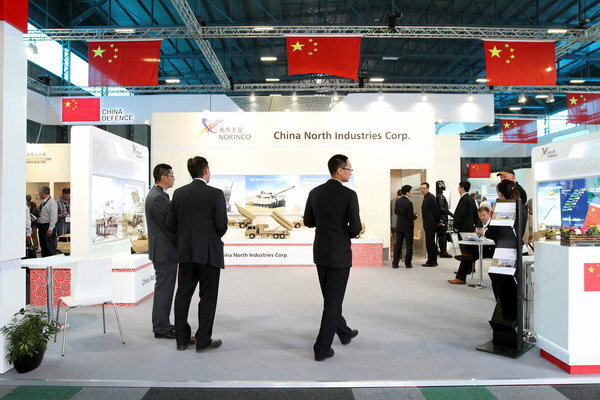 Weeks earlier, Norinco joined 115 other companies in Beijing for a May conference intended to encourage closer ties between private firms, state-owned enterprises and military officials. Fan Changlong and Xu Qiliang, two vice-chairmen of Central Military Commission that commands the PLA, were also in attendance. Maine Governor Paul LePage visited Beijing in June to meet with Norinco executives and discuss the construction of the railcar plant at the Loring Commerce Center. Carl Flora, president and chief executive officer of the Loring Development Authority, said in an e-mail in Sept. 5 that discussions about the project are continuing. Norinco’s expanding commercial presence around the globe includes making subway cars in Mexico and mining in Myanmar. Its subsidiary, Lingyun Industrial Group Corp., bought the world’s largest supplier of car latches in Germany last year, the group’s first overseas acquisition. In places like South Sudan, the pieces come together. Norinco’s arms sales help the government protect CNPC’s oil operation. Meanwhile, the company is free to explore civilian projects in the country. Its Shenzhen-listed engineering and construction unit, Norinco International Cooperation Ltd., opened an office there in March, Sina.com reported. China Has Set The Standard For Mankind!